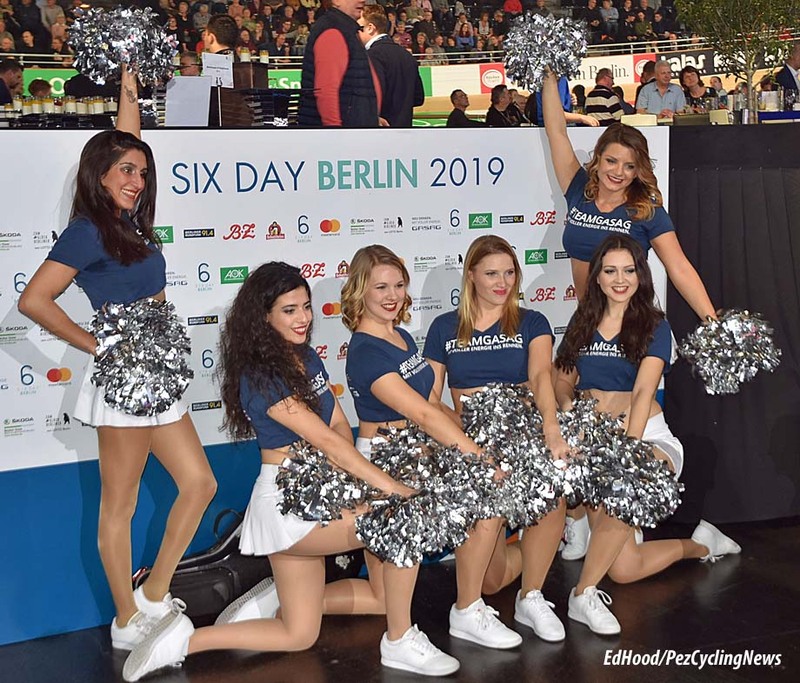 Trackside Ed: Ed Hood is on the road again; Bremen is just a memory as he packs up the big top in Berlin and moves with the '6 Day' circus to 'wonderful, wonderful' Copenhagen. 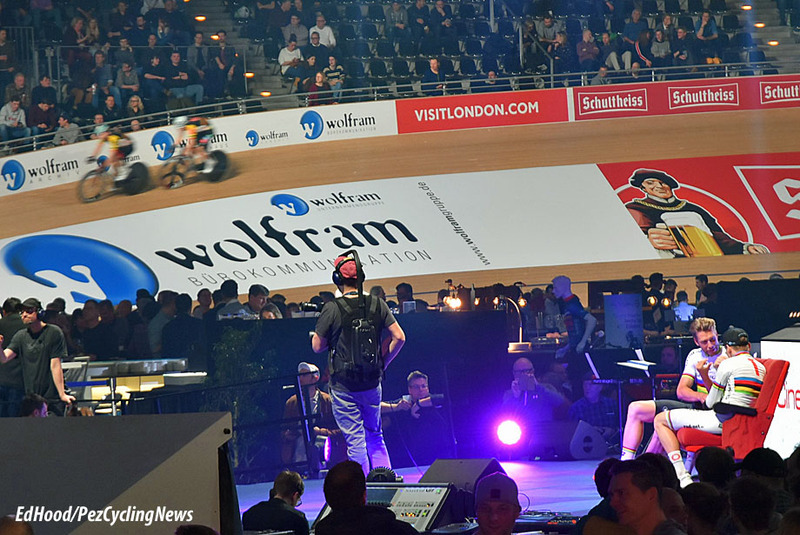 There was still the final night of the German capital's race entertainment to put to bed before the long trip north to Denmark. 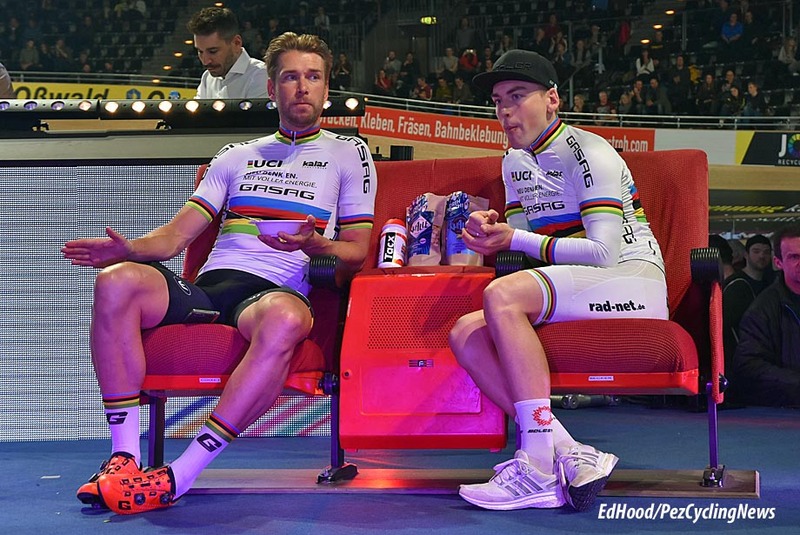 It was lucky 13 for Roger kluge and Theo Reinhardt; that was the number of laps remaining in the final chase in Berlin on Tuesday night when big Lotto Home Boy, Kluge launched the attack which produced the winning lap gain to take the Deutsche Duo clear of Double Danskas Jesper Morkov and Marc Hester with their superior scandic points tally. The crowd were in raptures; down among the camp followers there were more than a few yawns. A more cynical man than me might suggest that it was helpful when the peloton parked up as soon as Big Rodge bolted - but I'd never imply such a thing. That said, Kluge was the strongest man on the boards albeit he’s a World Tour Giro stage winner riding against a field where some of the opposition aren’t even at Continental team level. 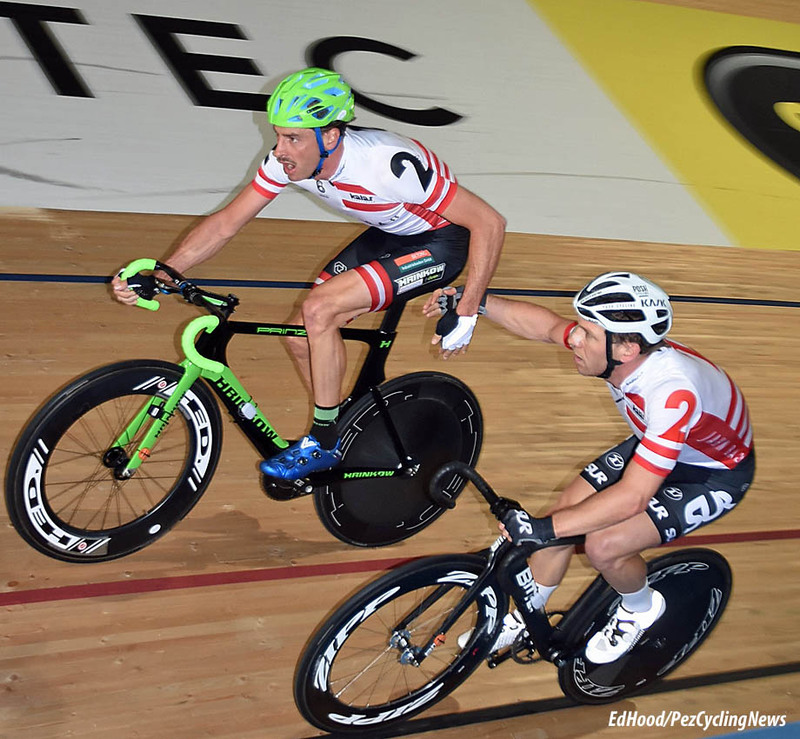 Austrian Andreas x 2 Muller and Graf took the final spot on the podium. My last six day was Bremen with it’s 160 metre wall of death plywood bowl squeezed into a far from huge exhibition hall. I parachuted into Berlin for the final night to help Kris break camp and then take the long trek north on the concrete section to Rostock, the Baltic ferry to Denmark, then run north across frozen, flat fields and the Copenhagen Six Day. 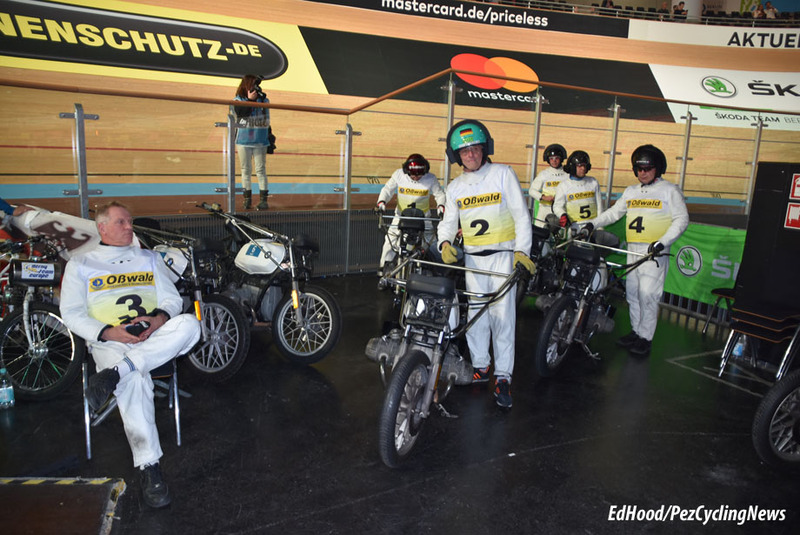 When I emerged from the tunnel at the Berlin Velodrome, even though I've been there many times, I was struck by the sheer scale of the place. The largest unsupported steel roof in Europe hovers over a 250 metre track with towering, golden Siberian pine bankings designed to handle huge stayer racing speeds. There's seating by the acre, artificial light to drive a green energy fanatic to drink and a sound system blasting out everything from Kiss to the Black Eyed Peas. And good to see that in this politically correct world there are no scantily clad podium girls. . .
Our charges are Aussies Joshua Harrison and Stephen Hall. 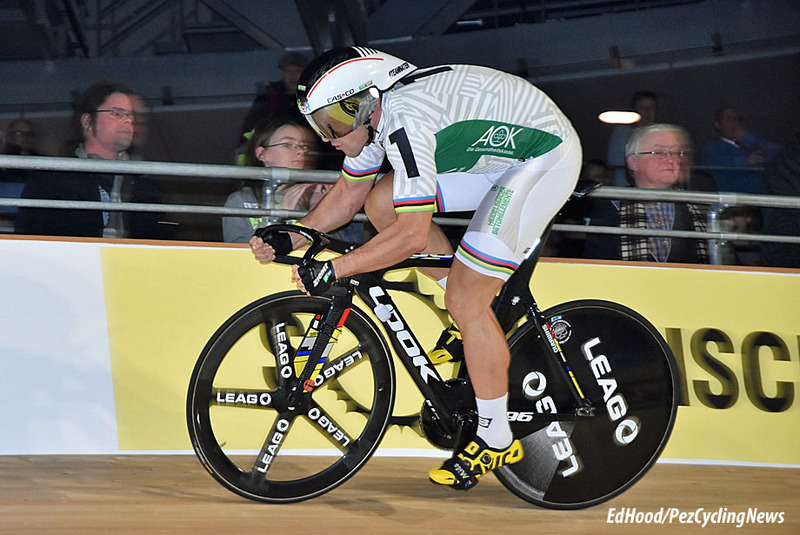 Josh was World Junior Team Pursuit Champion in 2013 and is reigning Oceania Points, Scratch and Omnium Champion whilst Stephen has won races as diverse as the US Sprint GP at Trexlertown Velodrome, via a stage in the Tour of Thailand to the 2017 Australian Team Pursuit Championships and the GP Mengoni in New York City. Josh had to sit out the last night due to problems with his shoulder so Stephen teamed up with big Englishman, Chris Latham whose partner Andrew Tennant is out with illness. 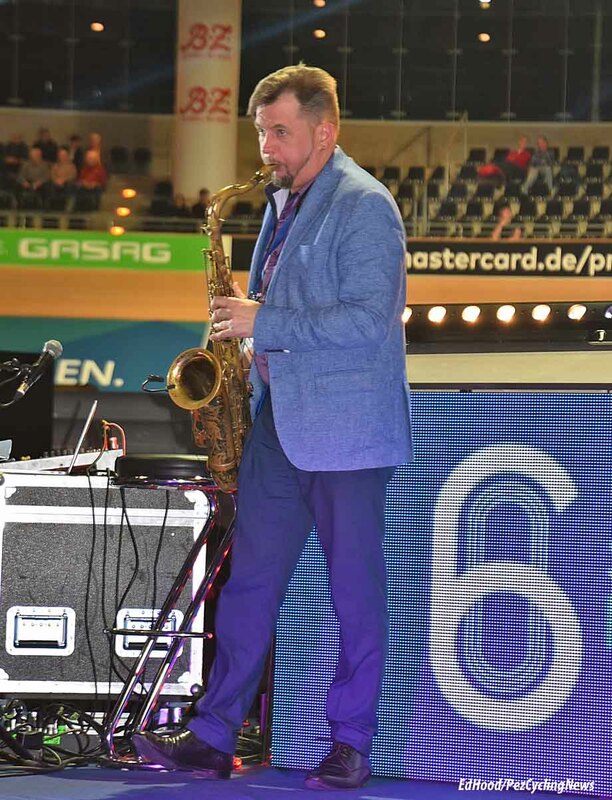 This is a Madison Group production so no rolling presentation; the teams walk up a ramp to a central stage in the track centre – and the guy providing the backing music on the sax was actually very good. 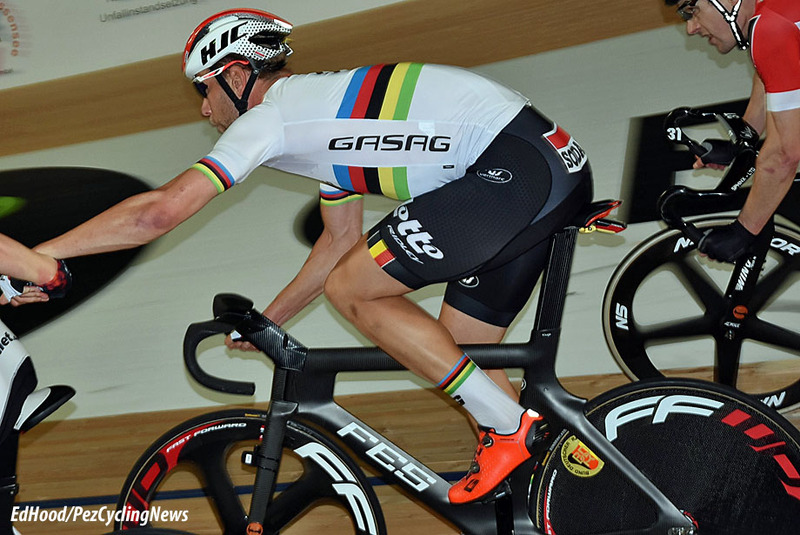 The first chase went to the Austrians; even though Andreas Muller has Austrian nationality, he’s a Berlin boy and the crowd always like a home win. 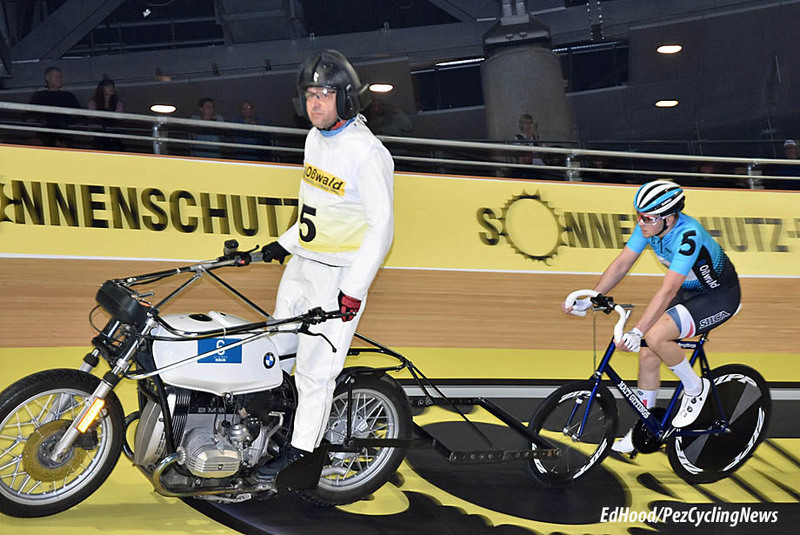 The old Bee Emms roared into life and it was ‘stayer’ time – the Berlin crowd loves the big motor pacing even if the noise and exhaust fumes are hard work. 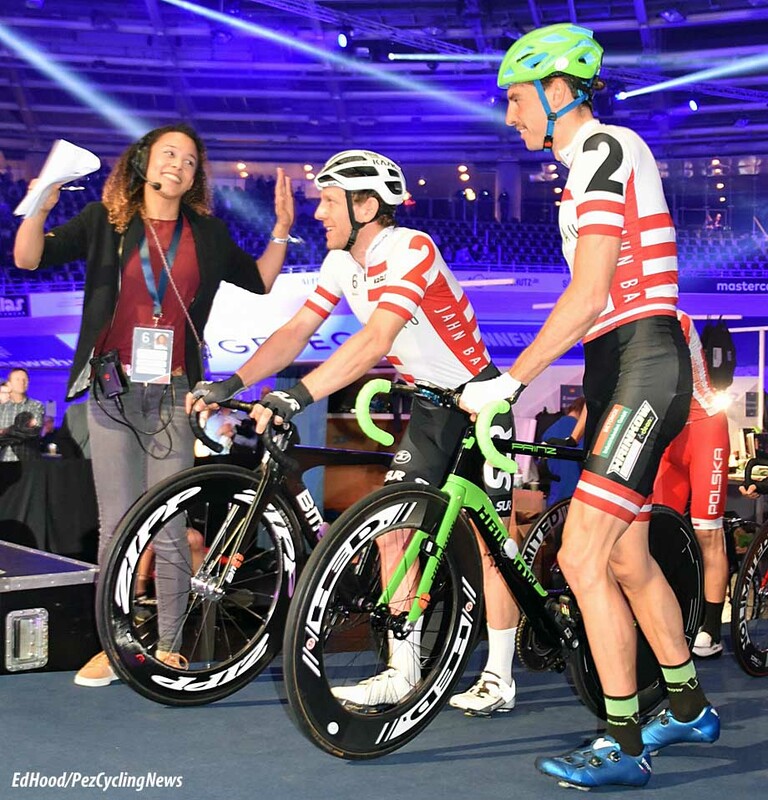 Young Englishman Matt Gittings, is over from the US where he runs cycling programmes at Marian University and the Indianapolis velodrome. 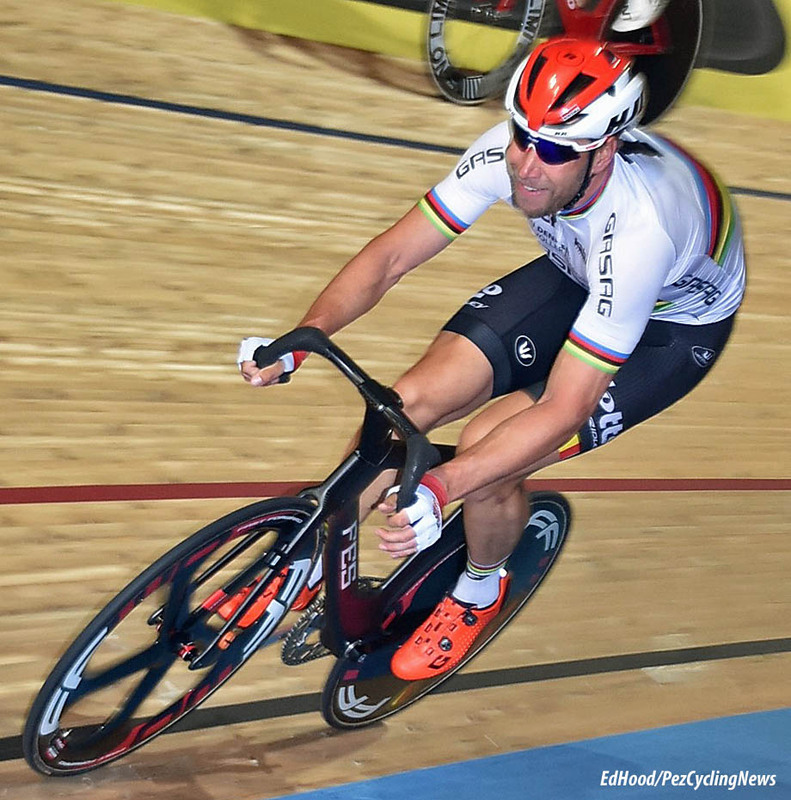 He was out front early – never a good thing in a stayer race – and sure enough, the rest picked him off, one by one. But good to see a Brit behind the big motors, a rare sight these days. 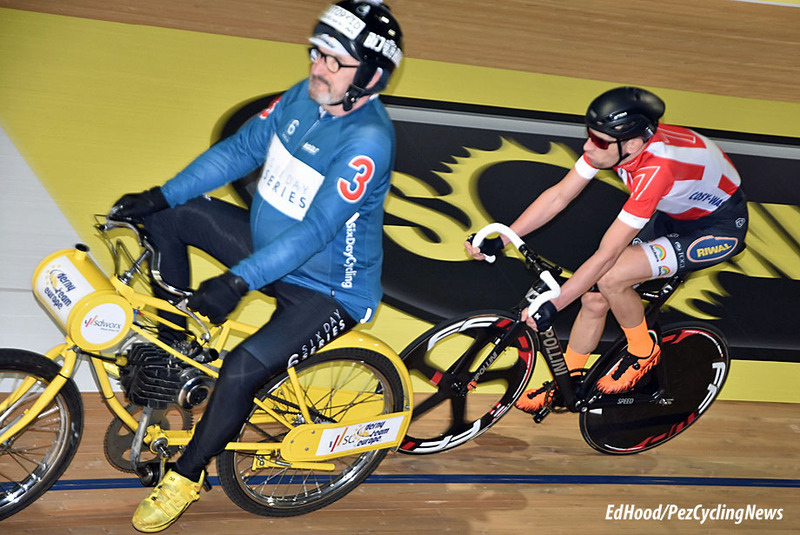 If there’s one thing the Berliner crowd likes more than their stayers, it’s their sprinters – and Home Boy Max Levy in particular, who’s been around forever. ‘Their’ Max was quickest in the flying lap with a 12.2, to the delight of the crowd. 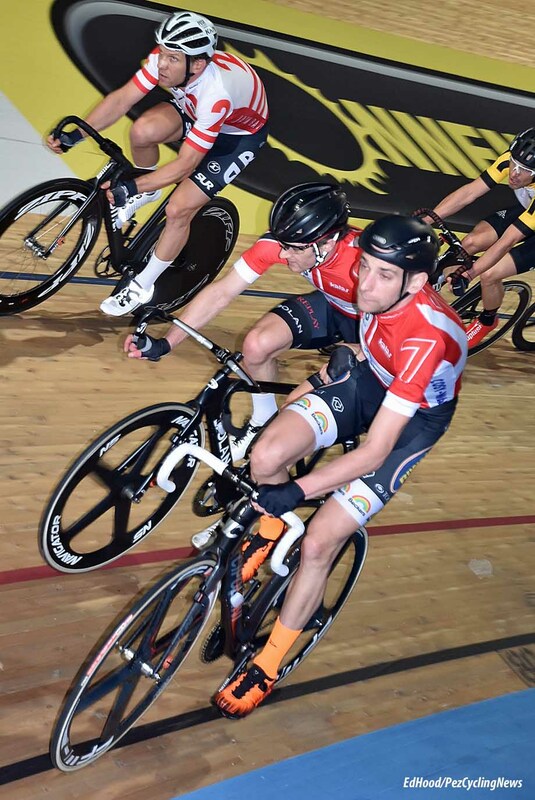 Also scorching the boards were, former Commonwealth and world champion – and current Russian Keirin Champion, ‘Rustralian’ Shane Perkins and not to be messed with Russian ‘Bond Villain’ lookalike Denis Dmitriev. 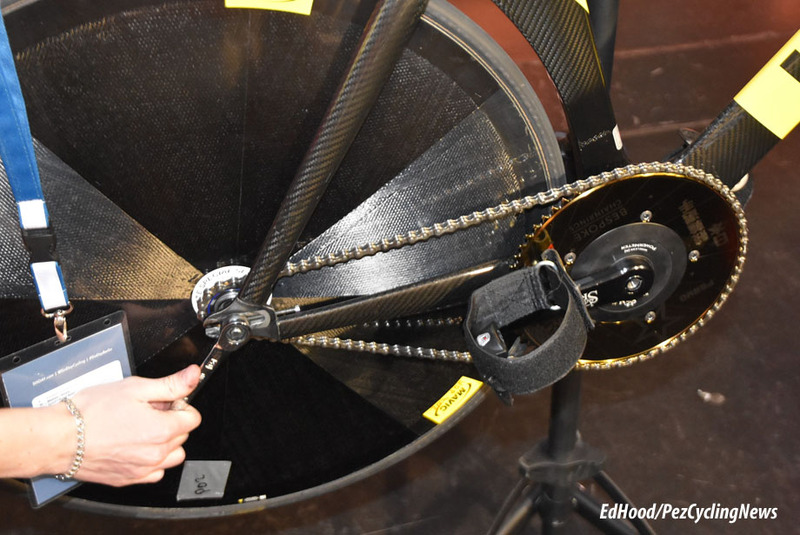 I remember the days when sprinters rode 50 or 51 tooth chainrings; now it’s 63 . . .
Of course, no one could. Derny time; you either love them or hate them – I’m not saying which camp I’m in. 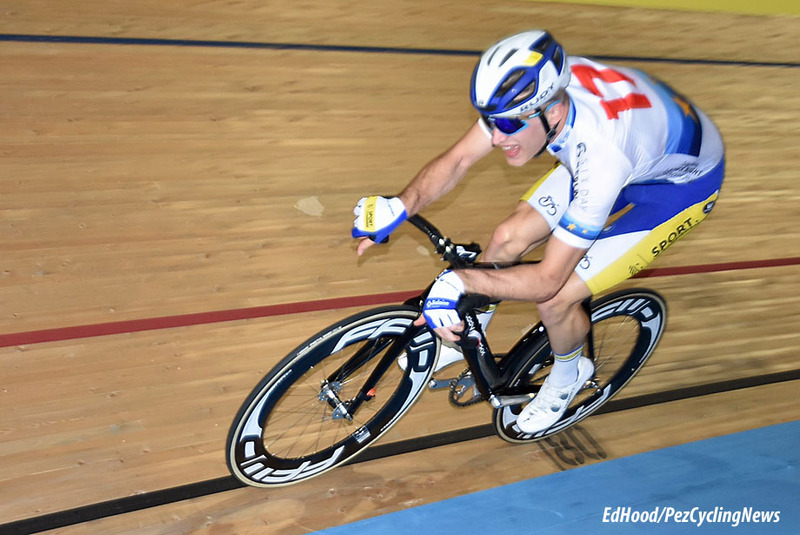 Former European Derny Champion, Jesper Morkov came late – don’t they always – to win in spectacular fashion. It brought the house down – naturally. 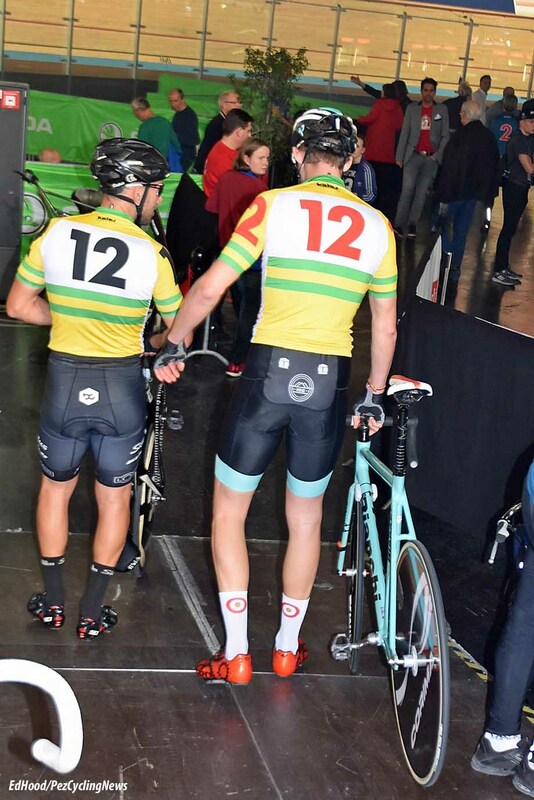 The big guys got back up on the boards and Rustralian Shane was best in the keirin. 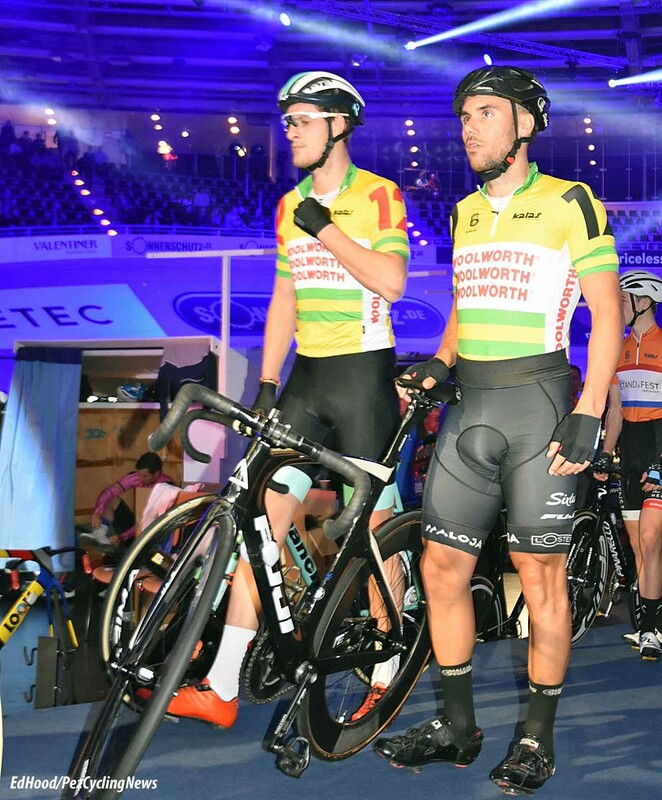 The six day riders programme wasn’t heavy – it’s all about the big chase on a last night - but they did get up for the elimination which was won by ‘coming’ six day man, Rob Ghys of Belgium. 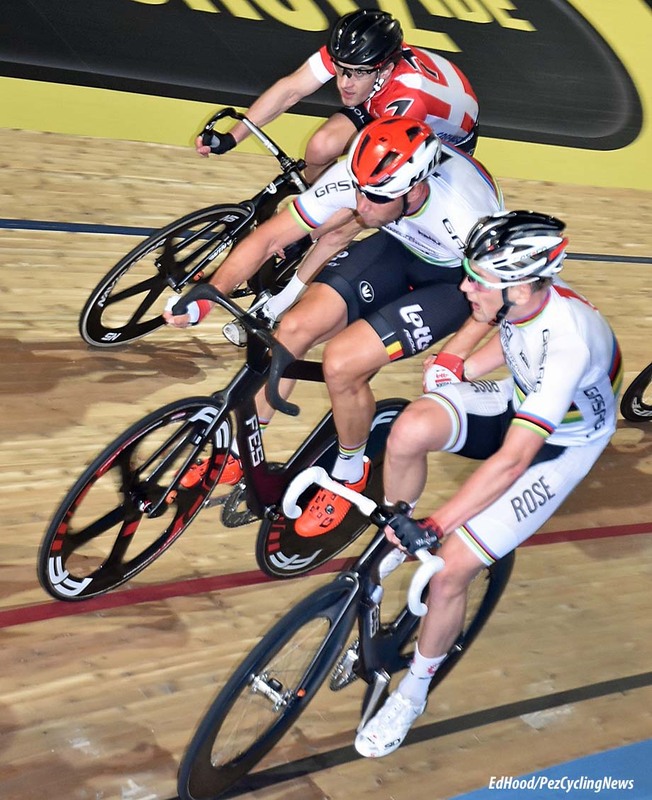 Ghys is a multiple Belgian champion on the track and reigning European Madison Champion with Topsport team mate, Kenny De Ketele. 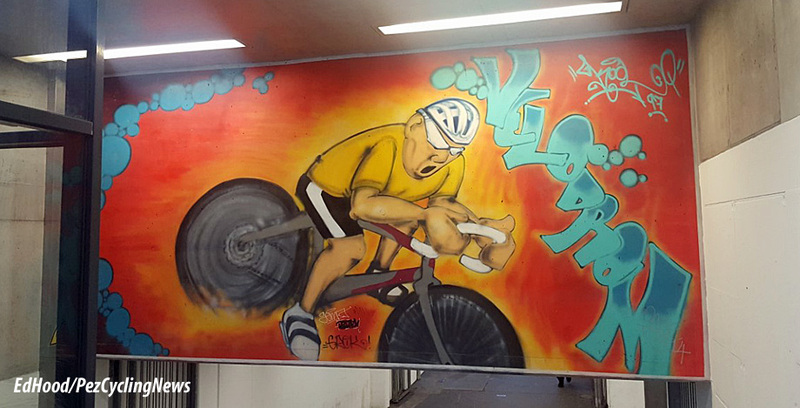 Kenny broke his collar bone in Rotterdam but will be back for Copenhagen – you can’t keep them Belgian six day boys down. More sprinting, this time the match final and it’s more Max – my, that was a surprise. . .
Big chase time – as soon as the gun fires we begin packing and miss the first half of events. Going in to the last hour it was the Danes in the lead with little between the top five teams. By the time I’d humped the dryer, flasks, cool box, cushions and bottles the chase was well on but it was late in the day when Kluge rose from the saddle and flung himself into the attack which would win him the race. It didn’t take long, maybe three or four laps; perhaps I imagined those chases ‘back in the day’ when the team going for the winning lap was hung out front to fight for five minutes – not laps - before the junction was made just as the bell rang? Roger even permitted himself a half smile as he came round to make contact with the tail of the string. No time for podium pics for me, we have kilometres to cover and a ferry to catch and the next race to nowhere – on the other side of the Baltic, up in Copenhagen.